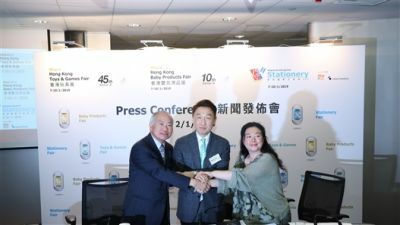 HONG KONG, Jan 4, 2019 - (ACN Newswire) - The 45th HKTDC Hong Kong Toys & Games Fair, the 10th HKTDC Hong Kong Baby Products Fair and the 19th Hong Kong International Stationery Fair will be held from 7-10 Jan at the Hong Kong Convention and Exhibition Centre (HKCEC). Close to 3,000 international exhibitors will showcase an assortment of innovative products at the three concurrent events. Hong Kong's exports, including products such as toys, performed better than anticipated last year due to strong global market demand and exporters shipping goods to the United States early to avoid new tariffs. 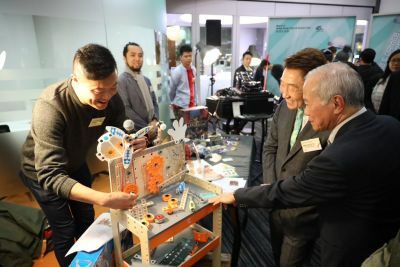 HKTDC Deputy Executive Director Benjamin Chau said that exports of toy products in the first 11 months of 2018 amounted to HK$45.2 billion, up 1.6% year on year. However, the HKTDC Export Index for the fourth quarter of 2018 showed all industry sub-indexes edging down, reflecting the fact that exporters in major industries, including the toy sector, have a cautious view in the short-term. Retail sales across different markets over the recent Christmas period showed a mixed performance, with the United States and various emerging markets showing robust growth, while certain traditional markets saw growth at a slower pace. Mr Chau said: "Video game consoles and games incorporating virtual reality (VR) and augmented reality (AR) are currently very popular. Licensed toy products from popular movies and animations as well as educational toys remain the major driving force in the sales of traditional toys. The Hong Kong Toys & Games Fair gathers a wide variety of products from around the world to match buyers' sourcing needs." Asia's largest, and the world's second-largest, trade fair of its kind, this year's Hong Kong Toys & Games Fair has attracted more than 2,100 exhibitors from 42 countries and regions. The latest toys and games from around the world will be showcased in six group pavilions, including Mainland China, Korea, Spain, Taiwan and the United Kingdom, as well as the World of Toys pavilion that will feature mainly European exhibitors. Another highlight, the Brand Name Gallery, will showcase around 240 renowned brands, including 4M, Hape, Ming the Minibus, Soap Studio, STEM University and Welly. 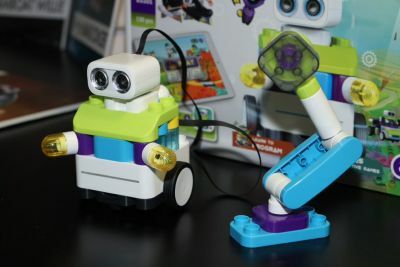 The popular Smart-Tech Toys zone will feature a variety of toys and games that incorporate innovative technologies, including AR and VR functionality and mobile app compatibility. A STREAM Toys Product Display will again be set up to respond to rising demand for STREAM (science, technology, robotics, engineering, arts and mathematics) educational toys and games. Other thematic zones include Kidult World, showcasing toys for grown-ups such as magic items, hobby goods, action and war games, and models and figurines; the Pet Toys zone, featuring toys and daily supplies for pets; and the Fireworks zone. The concurrent Hong Kong Baby Products Fair will welcome more than 610 exhibitors from 29 countries and regions. The fair will also see pavilions from Korea, Singapore and the Hong Kong Children, Babies, Maternity Industries Association. To cater for the needs of mothers-to-be, the debut Maternity Products zone presents a range of pre- and post-pregnancy essentials for mothers, ranging from hospital bags to breast pumps and more. The Brand Name Gallery will present close to 50 renowned quality brands, while Baby Tech will feature 21 exhibitors displaying high-tech smart products. The World of Strollers & Gear II at Convention Hall returns this year to reveal award-winning strollers and baby car seats. Organised by the HKTDC and Messe Frankfurt (HK) Ltd, this year's Hong Kong International Stationery Fair features more than 260 exhibitors from 14 countries and regions, including first-time exhibitors from Australia and Malaysia. The fair will once again feature Korea and Taiwan pavilions. A strong range of industry-leading brands will showcase the latest art and craft supplies, back-to-school items, paper packaging and printing goods, office supplies and gift stationery. Another highlight of this year's show is the "One Moment in Time" display at the entrance of Hall 5B, showcasing the various kinds of stationery that people use in different stages of life. A series of industry events will be held during the three fairs. The Hong Kong Toys Industry Conference 2019 will take place on 8 January under the theme "Forging the Bright Future for the Global Toy Industry", where representatives from Euromonitor, the strategic market research company, will join toy industry consultants and experts to examine industry trends in the global market industry, challenges resulting from current Sino-US trade relations, and opportunities arising from the Belt and Road Initiative. Other thematic seminars include "Smart Tech & DIY Toys - What's New? ", "Toy Safety & Regulations Updates", "Toys Compliance, Testing & Certification", "Expanding Your Business Through Trade Financing", "Insight into the Upcoming Stationery Trends" and "Digital Marketing: Innovation Key to Success", featuring speakers from Guru Online and Madcradle Online. In addition, the winning products from the Hong Kong Toys and Baby Products Awards 2019 will be exhibited at Halls 3F-G Concourse during the fair period to showcase the most creative designs to international buyers. Events such as a networking reception, product demo and launch pad, and a buyer forum discussing business opportunities in emerging markets, will also be held during the fair period. Held concurrently with the Toys & Games Fair, Baby Products Fair and Stationery Fair, the HKTDC Hong Kong International Licensing Show is Asia's largest and the world's second-largest fair of its kind. This year's fair brings together more than 400 exhibitors from 14 countries and regions, showcasing over 1,000 brands and properties. The four fairs will create abundant crossover business opportunities among participants from various sectors. From left: Lawrence Chan, Chairman, HKTDC Toys Advisory Committee, joins Benjamin Chau, HKTDC Deputy Executive Director, and Judy Cheung, Deputy General Manager, Messe Frankfurt (HK) Ltd, to introduce highlights of the Hong Kong Toys & Games Fair, Hong Kong Baby Products Fair and Hong Kong International Stationery Fair, which run concurrently next week (7-10 Jan) at the Hong Kong Convention and Exhibition Centre. Hong Kong exhibitor Pai Technology (booth: 1C-F34) presents PaiTots, a programmable robot allowing children to build, control, code and play, and experience the magic of augmented reality. Hong Kong exhibitor Hape (booth: 1E-C02) has launched the Deluxe Scientific Workbench, which contains everything children as young as four need to conduct over 15 experiments and demonstrate key scientific principles.